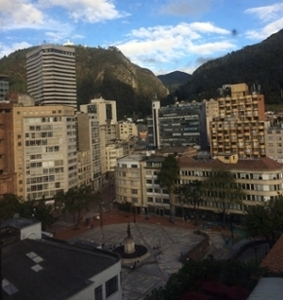 College of Liberal Arts students and a faculty member traveled to the Universidad del Rosario, Bogota, Colombia to participate in a Model United Nations Conference. With over 500 students from over 60 countries, students participated on various committees that engaged them in the discussion of current, historic, and futuristic topics that influence the world we live in. 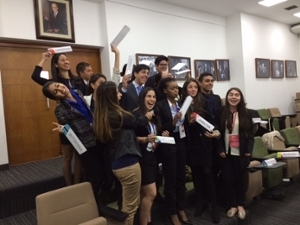 Below is a recap from Model UN participants from Bogota, Colombia. I am extremely grateful to the Purdue Political Science department for creating the experience to participate in the Model UN conference in Colombia. To prepare for the trip I have been reading up on Constitutional, which my specific conference will be dealing with. I am also really interested to see Colombia. I know the country will be beautiful, and this will be a once in a lifetime opportunity to see Bogotá in the flesh. Many people have said to be safe while in Colombia, but I feel that it is a safe country, and its reputation for being potentially dangerous is overblown. I am looking forward to having the opportunity to network and interact with many other students from around the world. I am anticipating lots of productive work towards solving problems within our committees as well as growing closer with my fellow Purdue Political Science students. This is my first time traveling abroad since I was little and I am looking forward to experiencing a new and different culture and am thankful for this wonderful opportunity. I expect this trip to teach me more about the workings of the United Nations as well as the committees. I also expect this trip to teach me more about other countries and the workings of the International System and how they pertain to the World Order. In all honesty I am nervous about this trip due to it being in a foreign country as well as my limited practice of the rule and procedures of Model United Nations. When we arrive at Colombia, I'm not sure what to expect. I hope that it will be insightful and besides creating resolutions, I hope to learn from the other international students that have more hands on experience and knowledge with some of the situations. I've have been to Latin America before so I look forward to being back and re-familiarized with the culture as well as representing Purdue at the University of Rosario. 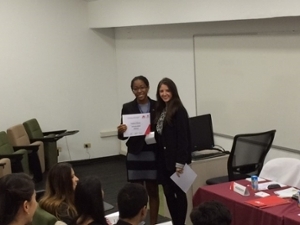 During the Model UN (MUNUR) open ceremony, students heard from the former Colombian ambassador to Japan, the President of the Universidad del Rosario, the Fulbright director for Colombia, the former Secretary General of MUNUR (a student), a senator, and a university student. Among themes addressed by the speakers, today's historical juncture for Colombia was most prominent. The government and the FARC are in the peace process, negotiating a peace plan. This period marks the dawning of a new era in Colombian politics and life. 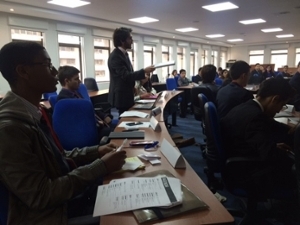 Following the opening ceremony, students broke out into their committees. No real business in the committees took place. The diplomacy begins tomorrow (Saturday). The students will be immersed in debate and negotiations for nearly 12 hours. The second day of MUNUR included debate and negotiations in the committees. Purdue students are delegates on the African Union, San Francisco 1945, the US Supreme Court, and SPECPOL. The delegates for the African Union considered matters on women and education and security. On the San Francisco 1945 committee, their task was to design the Security Council of the UN (imagining they are the framers of the organization during its creation). The case of the Japanese internment camps during WWII was before the US Supreme Court. Delegates on SPECPOL negotiated the status of non-self governing territories and paths to self-determination for these countries. Following the suspension of committees, a welcome session was hosted for international participants. During this session, we learned about the Universidad del Rosario's (the University of the Rosary) history and academic programs. An invitation was extended to all international students to return for a study abroad experiences. Students also received small gifts from their hosts. The evening was spent mingling and getting to know new friends in an area called Zona T in the north of Bogota. Much of the day was spent making and voting on amendments to the draft document they created the previous day.Crises emerged in the African Union and SPECPOL that forced students to be flexible and nimble in solving unanticipated situations. In the US Supreme Court committee, there was fiery debate among the justices on the question of whether to uphold or dismiss the case before them. By the end of the session, the justices voted. The San Francisco 1945 committee moved closer to finalizing the structure, function, and capabilities of the Security Council. Model UN delegates drafted various working papers and resolutions to address global issues. Dinner this night was hosted by Purdue alumnus Gilberto Gomez and his Piler who have lived in Bogota for 25 years. The day ended with a MUNUR social engagement.The Purdue group had lunch in a quaint Bogota restaurant, where paella was the specialty. For most, it was their first experience with this tasty dish. 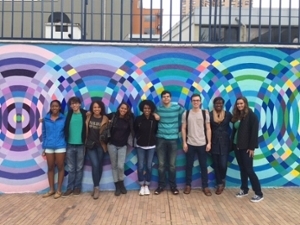 During lunch, they visited Plaza de Bolivar. This is a popular site for locals and tourists and is an important location for governmental and cultural buildings. The final day of MUNUR was bittersweet. 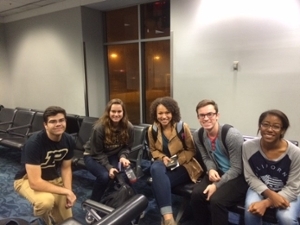 Purdue delegates participated in a limited schedule due to travel plans back to campus. All committees wrapped up final negotiations and voting of resolutions. In some student committees, resolutions passed that were favorable to the students and the nations-states they represented. 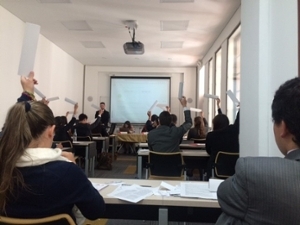 And, in other committees resolutions passed that did not support the students (nations-states). MUNUR is an excellent example that compromise is part of achieving goals. As MUNUR committees concluded, delegates were presented with certificates of participation. MUNUR and the Universidad del Rosario hosts were welcoming and accommodating. MUNUR is the outcome of terrific student efforts including the organizing, content, and logistics. The Universidad del Rosario is a historic institution with a beautiful architectural feel. Bogota is a fascinating city. It's filled with contrasts: the green of the mountains with the concrete of a city; the Calendaria, old town, with the Zona T in the north; structures from the 17th century with contemporary ones. What was most interesting was the abundance of street art with graffiti mixed in. In the Calendaria, one is surrounded by it. The street art is amazing and gives the city a unique flavor. The one undeniable constant is the warmth of the people. My experience at MUNUR was amazing. I learned so much about international relations and policy through my committee work and about Colombian culture through our exploration of the city and the hospitality of the lovely Colombian people. The overall trip was very eye opening. Although at Purdue there are a variety of students from different backgrounds, I am never immersed in a specific culture. While in Colombia, I was able to interact with students from all over Latin America as well as experience their culture. We were able to see local attractions as well as social events that coincided with the conference. The students that I met were very welcoming and also opened my eyes to the education system overseas. Although my stay was short, I think I made friends and I would like to participate in this kind of conference again. Overall, this was an amazing trip. I learned so much about international relations and the United Nations as well as making friends from all around the world and sharing in their ideas and culture. This trip has taught me how to implement my classroom studies into the working world and how valuable real life experience can be. This trip was truly a blessing. The trip to Colombia for MUNUR15 was wonderful. An interesting city, incredibly kind people, and an intellectually stimulating environment made up the weekend. The people that we met were interested in our culture and school. The conference itself went very well and the committee work was gratifying. If given the opportunity to do something like this again, I would do so in a heartbeat. The experience at the Universidad del Rosario and MUNUR15 cannot be properly explained in words. I've gained a new perspective on international relations and have now been exposed to the views of hundreds of other students from across the world. 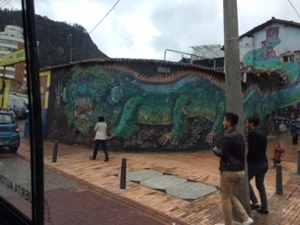 Bogotá is beautiful, the Colombian people are some of the nicest I have ever met, and the culture I have been exposed to is one I will never forget. This experience will surely be one of the highlights of my time at Purdue, and I am very thankful for the opportunity to attend! Thank you Dr. Clawson (Deparment of Political Science, Head)! Thank you Department of Political Science! Thank you College of Liberal Arts! Thank you Purdue for this unforgettable opportunity!